It’s Time to Talk About Self-Checkout – Writer. Editor. Storyteller. I made the mistake of going to the supermarket on Super Bowl Sunday. That was my first mistake. I got to the grocery store closest to me and realized it was packed, so I decided to drive the extra half a mile or so to the next grocery store where they have those guns that allow you to scan your groceries as you go, bag them directly in your cart and then breeze through self-checkout. I assumed this would cut at least a few frustrating minutes off of my trip. (I would have just skipped the trip but I needed breakfast for tomorrow and ingredients for banana bread to make use of the over-ripe bananas in kitchen.) I was wrong! I realized quite some time ago that it was completely stupid to try and go through self- checkout with a basket full of groceries unless you’ve got backup to help you bag. If you try to do it all yourself, you slow down the process and if the store is busy, you piss everyone off. And today, one woman nearly started a riot. There I was, with my little gun, and two bags of groceries, ready to scan a barcode, whip out my debit card, and move along. The lines were long everywhere, and you would think that any decent human being with a big basket of groceries would hop on a line with an actual human behind the counter and someone to help them bag. But you’d be wrong… I walked by one self-checkout after another — the lines practically reaching back to the supermarket aisles themselves — where people had fully loaded carts. I wanted to pull my hair out. I finally chose a line, behind a man with an armful of groceries, and an older woman with, not quite a full cart, but enough to make me silently seethe. It’s especially galling because everyone who walks through the automatic doors at that store can grab the scanner just like I did. And then, of course, she had weird packaged oranges that wouldn’t scan. And instead of seeking out someone for help — because clearly, on a busy day, there isn’t an attendant standing at the ready — she just stood around waiting. Long story short, when I finally got to the register, I sailed through. If it took me more than a minute to checkout, I’d be surprised. Which is to say, if these self-checkouts are going to keep proliferating, we’re going to have to set up some rules to keep fights from breaking out in the checkout line. Self-checkout should be treated like an express line. If you have more than 12 items, going to the normal cash register is the only decent thing to do. If you want to do some power-shopping, and use the self-checkout, you must use the scanner gun. If your store doesn’t have one, find another store. If you are unfamiliar with the process, or don’t understand how to use a touchscreen practice when the store isn’t busy, or drag along your grandkids. Do you have any recommendations to keep your fellow man from being bludgeoned at the self-checkout line? Or other tips for not being a jerk while navigating modern life? Haha. 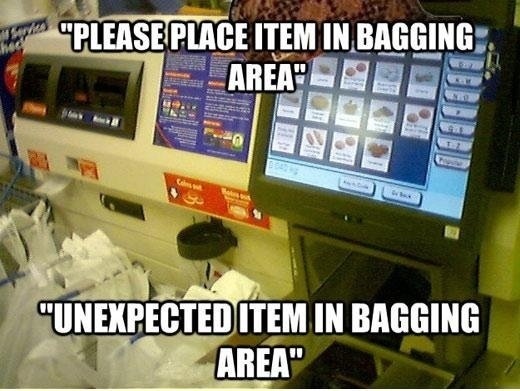 Sounds like you’re still something of a self-checkout newbie. My family and I have been using them almost exclusively for a couple of years and see this regularly. But it’s getting better. Our stores in California don’t use the guns, just the register with the bar-code reader. If an item doesn’t have a bar-code (e.g. packaged oranges), then it usually is a snap to look it up or key in its sticker code. I’ve seen it before as well, but since I usually shop at odd hours to avoid crowds, it usually doesn’t matter. But c’mon… Super Bowl Sunday is no time to mess around. People need to get home with their chips and salsa! I’m glad you got that off your chest. I’ve never come across the guns that you zap your shopping with as you go! Here in the UK it’s still just the register, and while I tend to use that more than anything I never do it with a full trolley – just a basket full like a normal express line.